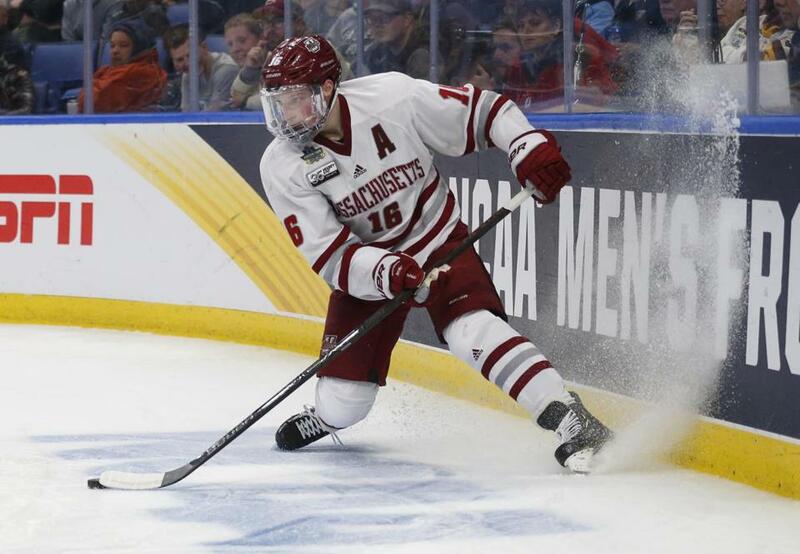 Cale Makar guided the Minutemen to the Division 1 men’s final and signed an entry-level contract with the Colorado Avalanche on Sunday. BUFFALO — Throughout the week of the Frozen Four, UMass coach Greg Carvel and star defenseman Cale Makar did their best to not look past Saturday night’s NCAA championship game. But with the season officially over, the move everybody knew was coming was confirmed: Makar is forgoing is final two years of eligibility to join the Colorado Avalanche. The organization announced the signing on Sunday. Carvel praised Makar after the championship game. “When you get a kid like Cale, you feel a lot of responsibility as a coach to develop him and make sure — he could have gone anywhere, could have done anything. But he chose to stay loyal to his commitment to UMass. I took it and our staff took it as a huge responsibility. “The thing that I love about Cale is that he never makes you feel like he’s doing us a favor by playing for UMass. He’s very grateful for what we did for him. It’s genuine. “He didn’t look at UMass as a steppingstone that he was going to fly by. He looked at UMass as a very important part of his life, and I give him so much credit because he did everything absolutely right, every last part of it. That’s why I’m so happy that he won the Hobey Baker award because he’s absolutely what you want in a Hobey Baker winner. Earlier in the week, Carvel was asked about his favorite memory from the season the day before the Frozen Four. “I think my favorite memory will be coaching Cale Makar. It’s been a special opportunity. He’s a really special kid,” said Carvel. Makar apparently has also made an impact on Carvel’s family. Makar signed an three-year entry-level contract with the Avalanche and will join the team immediately. Colorado is tied, 1-1, in its Western Conference first-round playoff series with the Calgary Flames. Game 3 of the series is Monday night in Colorado. For Makar to make his NHL debut in the playoffs would be unconventional, but not unprecedented. Two years ago, Charlie McAvoy made his NHL debut in the Bruins’ playoff series against Ottawa on April 12. McAvoy was able to play four games with Providence in the AHL after finishing his sophomore season at Boston University before getting the call for the postseason. Makar, 20, was born in Calgary. He was selected by the Avalanche with the fourth overall pick in the 2017 NHL Draft, the highest selection of a UMass player. Globe Correspondent Brandon Chase contributed to this article.